There are over 400K Steam Controllers in the wild, but Valve are aware the hardware could do with some improvement. With that in mind, there’s a hardware revision planned for some unspecified time in the future. I’ve heard the Steam Controller is alright for some things, like a lot of our list of best strategy games, for example. 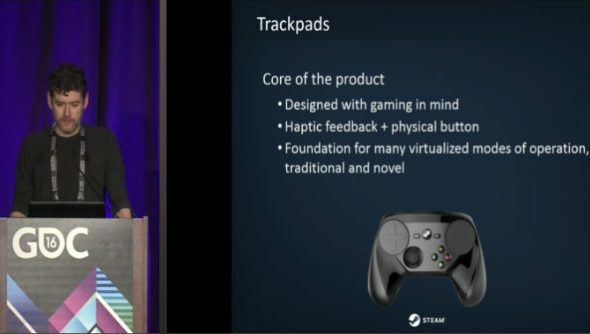 This information comes from a GDC presentation talking about the design of the hardware, the reception and the future. It isn’t clear how many of those 400K units are sales, but it’s still a decent number of controllers in the hands of players. Hopefully the hardware revision isn’t too soon, as Valve might find the ones who did buy it slightly annoyed. Saying that, the new controller apparently won’t bring any new functionality and will be focused on visuals and ergonomics. Though Valve’sPierre-Loup Griffais wouldn’t commit to the controller’s second iteration having no capability improvements at all. “In the future, we are working on a hardware revision to the controller to improve look and feel,” says Pierre-Loup Griffais. “But we’re pretty happy with the feature set we have now and do not intend to drastically change it, or even change it at all. What would it take for you lot to buy the improved controller?